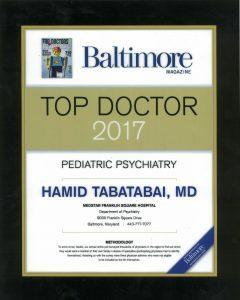 Hamid Tabatabai, M.D. – Hamid Tabatabai, M.D. Articles posted by Hamid Tabatabai, M.D. Board Certified in Child-Adolescent Psychiatry and Adult Psychiatry. Trained in The Johns Hopkins Hospital with more than 40 years of experience. Clozaril is a unique antipsychotic mood stabilizer, highly effective in many cases when no other medication has been. Not only the mood changes improve on it, it often improves thinking, impulse control and decision-making. It often prevents repeated admissions or need for long-term placements. Many psychiatrists however are unfamiliar with and avoid it. This is because on very rare cases, it can cause serious side effect of agranulocytosis (drop in the infection fighting white blood cells). Blood tests (CBC) are done prior to start of Clozaril and weekly thereafter, to ensure that WBCs are normal. The pharmacy will not dispense the medication without these results. These tests can be reduced to every 2 weeks, if the blood counts have been normal for 6 months and to once a month after a year. The usual therapeutic dose is 200-300 mg/ day, but it will start at the very small dose of 12.5 mg /day. The dosage then is increased at increments of 25-50 mg, at frequency of no shorter than 3 days. I do it more cautiously and at 25 mg increments. If for some reason your child skips taking it for a week or more, it should be resumed at a small dose once again. Not all pharmacies are set up to dispense it. Be sure to ask your pharmacy prior to the discharge, if they dispense Clozaril. Report signs of any infection (such as fever) to your doctor. Almost these symptoms are due the common illnesses that everyone gets (cold and flu). To be on the safe side, however, I recommend an examination and/or blood tests, even if it seems to be a common cold. Constipation is a frequent side effect. While constipation for a short period of time is not serious, a very prolonged period can be. Please monitor that your child is having regular bowel movements. Cardiac problems are very rare. Any unexplainable tiredness or shortness of breath should be reported to your doctors immediately. Your child should have routine EKGs and comprehensive blood test once or twice per year. Lithium is a mood stabilizing medication for treatment of bipolar disorders. It however can also counteract the lowering of the white blood cells cause by Clozaril (though this has not been proven with studies). I use it in some patients for this purpose. Make sure that your doctor knows the reason for it and not stop it, thinking that it is an unnecessary mood stabilizer. These are only a partial list of potential side effects. You should discuss any concerns or questions with your physician. Antidepressants are used to treat all of these conditions. there are numerous ones avaialble and it seems that every few months another one is marketted. I have found many of these medications “me too” drugs, i.e. they are very similar in their effectiveness and actions. I still use some of the older and well established ones (Zoloft, Paxil, Prozac, and Wellbutrine). Side effects include agitation, impulsivity, a “high” feeling and insomnia. Ritalin, Adderall, Concerta and Metadate are stimulants which help your child to ignore distractions and focus on their studies. Side effects include decreased appetite, headaches, increase TICs, agitation and insomnia. Strattera is effective in some children and used when stimulants are ineffective or cause side effects. It, too, can cause agitation. Clonidine and Tenex at times increase effectiveness of stimulants. Side effects include decreased blood pressure and pulse. Intunive which is the long acting form of Tenex, seems to be effective by itself, or as an addition, for some ADHD types. I avoid stimulant medications (used for treating ADHD) and antidepressants in bipolar disorders. They usually do not work in these conditions and often agitate such patients, increasing their tantrums, aggression, and psychotic symptoms. In out patient setting, when the symptoms are not severe, I assess the effectiveness of medications slowly and over a period of few weeks. In the hospital though, I have to act fast, trying to calm down a highly agitated patient and to discharge them from the confine of a hospital as soon as possible. In the acute cases, I am more liberal in use of antipsychotics in general and zyprexa in particular. I feel urgency in improving the mood and behavior of highly agitated children, to stabilize them and discharge them to their home ad normal life quickly. Lithium Carbonate: is very effective in classic Bipolar I disorders (used to be called Manic Depressive Disorder). It however is not as effective in Bipolar II disorders and other types of mood instability. Depakote, Lamictal, Trileptal, Topamax …etc. I have found Lamictal to be the most effective among these. It seems to be the only one with also an antidepressant effect, while it does not cause agitation as antidepressants do. It has a potentially dangerous side effect (Steven-Johnson Syndrome), which is very rare (about one in 100,000). To prevent such a side effect, it has to start at a very small dose of 25 mg and increased only 25 mg at a time every 2 weeks. It will take up to 2 months to reach a therapeutic dose of 200 mg.Abilify, Geodone, Haldol, Invega, Risperidone, Seroquel, and Zyprexa. There is a general concern about one particular side effect of these medications: increase in appetite, weight and risk of developing diabetes. Only Geodone does not cause this side effect. the therapeutic effect of these medication, however, seem to be associated with this side effect! The more effective ones such as Risperidone and Zyprexa cause it the most. Geodone on the other hand is the least effective! (The effectiveness in psychotic condition however is quite different, with Geodon being as effective as others). I however use Zyprexa often for the acute conditions that leads to hospitalization. It does not cause this side effect in some patients. It is the most effective and quite rapid. This will stabilize the Patient and the acute crisis, allowing time for the Patient, the family and the physician to assess effects, side effects and whether it should be changed to another medication. It should be stopped as soon as an increase in appetite is noted. The insatiable appetite is very hard or impossible to control. You might have already figured this out: there are currently no medical tests (blood test, MRI, scans, EEG,…) to help psychiatrists with the diagnosis of their patients. The diagnosis and treatment of these disorders are still scientific but in a clinical sense, by using carefully taken history, observation, and long-term follow-up and reassessment. Some conditions are easier to diagnose and treat such as clear cases of ADHD, psychosis or simple depression. Other conditions, especially mood disorders (also called bipolar disorders) can be very difficult to diagnose. Their symptoms are different in each child and can also vary in presentation over time in the same child. Their treatment is also often very difficult. The same medication that works well in one child, may fail in another. When the medicine is effective, it may stop working few months later. For this reason, you may get different opinions and recommendations from different psychiatrists. Understandably, this leaves parents extremely frustrated and distrustful of psychiatrists. Children with mood disorders can have temper tantrums, irritability, anxieties and insomnia. Their hyperactivity may seem like ADHD. Some children may have both conditions. As mentioned in the medication section, one has to be careful treating these children with stimulants. IMPORTANT NOTE: This is a summary and does not contain all possible facts. For complete information about these product ask your health care professional. This information is also for use in children. Adult patients may have medical conditions or be taking medications that will require additional precautions. Psychiatric medications are used to treat certain brain conditions (such as mood conditions, thought disorders like schizophrenia, or ADHD). They work by helping to restore the balance of certain natural chemicals in the brain. The dosage is based on your medical condition and response to therapy. Take these medications as directed, even if you are feeling better and thinking more clearly. Do not make any changes without consulting with your doctor. You should familiarize yourself with the side effects but do not allow them to scare you. In most cases they are mild & temporary. The serious side effects are very rare. Remember that the benefit of treating your child’s medical condition is far greater than the risk of side effects or leaving it untreated. Minor or moderate side effects usually go away by themselves or by reducing the dosage. You should however stop taking the medication if you notice serious side effects and report them to your doctor right away. Lithium is used to treat mood disorders (Bipolar conditions). Lithium is very safe in most people when you have the right amount of lithium in your body. Too much of it however, can be toxic & cause serious medical problems such as seizures, requiring immediate hospitalization. The difference between the correct amount of lithium and too much, is small. Therefore, it is important that your blood level be checked regularly. Fortunately, lithium’s blood level remains stable almost always if you do not take extra dose, don’t get dehydrated, do not have a kidney problem, and are not on a low salt diet. Also before it reaches a toxic level, it gives you warning signs such as nausea, diarrhea, shaking of the hands, slurred speech and wobbly gate. You should stop it right away and call your doctor if you have any of these symptoms. Take with food or milk or immediately after meals to prevent stomach upset. Drink 8-12 glasses of water or other fluid each day and maintain a regular diet while taking this medication. Do not change the amount of salt in your diet. Mild or temporary side effects: tiredness, increased thirst, increased frequency of urination, and mild trembling of the hands. Weight gain or severe tiredness or tremor, and skin rash may need discontinuation of the medicine. In some patients, lithium slows down thyroid gland. Again your doctor should order thyroid studies at the start of lithium and then periodically. If hypothyroidism occurs, lithium should be discontinued. In select cases, when lithium is the only medication that is effective for your mood disorder, the doctor may decide to continue it but supplement your thyroid hormone with prescribed hormone such as Synthroid. If the child accidentally overdoses, go to your emergency room immediately. If he has taken only 1 or 2 extra dose, he probably will be ok, but call your doctor right away to be sure. Many medications have more than one indication. For example, medications such as Depakote, Tegretol, Trileptal, Neurontin , Topamax , and Lamictal are also used to treat seizures and migraine. Like any other medication, you may be allergic to these & develop rashes & hives and should stop it in consultation with your doctor. Mood stabilizing medications can cause serious medical conditions on rare occasions. It is therefore a good idea to have some blood tests once a year preventatively. Tests for drug levels, liver functions and blood counts, are needed with medications such as Depakote or Tegretol. · Diarrhea, dizziness, drowsiness, hair loss, blurred/double vision, shakiness (tremor), weight increase. · Unlikely side effects: fast/irregular heartbeat, swelling of hands/feet, uncontrolled eye movement (nystagmus). · unlikely but serious side effects include a drop in platelets (small blood “cells” that help stop bleeding) which can cause unexplained bruising or bleeding. · Rare cases of liver or pancreas damage have been reported. They can show itself by unusual tiredness, swelling of the face, dark urine, persistent nausea/vomiting, severe stomach/abdominal pain, yellowing eyes or skin. Tell your doctor immediately or visit an emergency room if you develop these or any other unexpected & severe condition. This medication, like many others , is processed in the liver. They can increase or decrease liver enzymes & can therefore affect each others’ levels in the blood (increasing it & causing toxicity or decreasing the levels & effectiveness of the other drug). You should therefore tell your doctor or pharmacist of all prescription and nonprescription/herbal products you may use. If you miss a dose, take it as soon as you remember. If is near the time of the next dose, skip the missed dose and resume your usual dosing schedule. It’s a struggle for Andrew Fraser just to be here. He is sitting politely in the dining room of a Silver Spring church, where each Thursday morning all 36 students at the tiny Quaker middle school Andrew attends gather for silent meeting. The season is midwinter and the group, described by the school’s headmaster as mostly “bright underachievers,” is midway between childhood and teenagerdom. Some are dressed plainly, looking like kids whose clothes were picked by their parents; some wear camouflage and Eminem T-shirts. In the opening moments of worship, the room is remarkably quiet. The silence is finally broken by a teacher who mentions that in this season of short days, ancient cultures treasured light, which explains why winter celebrations center on lavish displays of it. In the Quaker tradition, you pray for someone by “holding him in the light,” and the teacher suggests that the students of Thornton Friends Middle School might do that now. A boy raises his voice to hold his mother and little sister in the light. 27 years. Andrew ricocheted and fidgeted through grade school, unable to tolerate more than a few minutes in class. He couldn’t bear to write. He left his seat constantly. He got into scuffles all the time. Home life wasn’t much better. The Fraser home, a Rockville rambler with a sunken den, frequently shook with Andrew’s tantrums. One morning, when Andrew was in fourth grade, he went after his older sister with a knife. Another, he was so enraged at life that he ripped the folding doors off his closet and threw them into the back yard, where he stomped them into slivers. Most mornings Andrew was a reptile coiled in his room, so unready to face the cruel exposures of the school day that his father had to dress him. Yet Andrew could be a nice kid — open, friendly, communicative. For that grace his teachers and therapists never entirely gave up on him. “Through it all, Andrew was liked,” says his mother, Wendy. His parents took him to a psychiatrist who diagnosed attention deficit hyperactivity disorder (ADHD) with “co-morbidities” — depression and possible conduct disorder. There were drugs to treat each malady. By the summer before middle school, when he was all of 11 years old, Andrew was on an enormous dose — 70 milligrams — of Ritalin for his ADHD, plus two antidepressants, Prozac and Pamelar, and the anti-hypertensive Clonidine, to counter the side effects of Ritalin. To make sure his heart could stand the stimulation of so much Ritalin, Andrew had his blood pressure checked weekly. Yet he seemed as distracted, irritable and unhappy as ever. Sometimes the drugs seemed to be making things worse. His father, Bruce, a stockbroker, and Wendy, a nursing administrator, were at wit’s end. “He’d cry. He’d threaten to jump out of the car. It was hard to see how he’d make it in middle school,” Wendy recalls. That summer, she got a call from counselors at a day camp that Andrew was attending. Her son had threatened to run into the street, they said, and was marauding around the place with a branch, intimidating counselors and other kids. Come get him. So they did. But this time, when they took Andrew to his psychiatrist, it was clear they had arrived at a threshold. The psychiatrist suggested putting him on a fifth drug, the antipsychotic Risperdal, whose side effects, the doctor explained, included tics, tremors and the risk of permanent brain damage. Children who are hyperactive and distracted, who can’t focus on what’s in front of them or control their behavior, have always been with us. They entered the medical lexicon in 1902, when a British physician, George Frederic Still, described a group of children with “morbid defects of moral control.” Still thought he could detect a child’s moral propensities by taking measurements of his skull. Since then, the medical definition of this disorder has certainly undergone many revisions. But in some ways it has come full circle. For years, the textbooks called it minimal brain dysfunction, then hyperkinetic syndrome of childhood. In 1972, Virginia Douglas, a Canadian researcher, characterized it as attention deficit disorder, and her terminology became the accepted way of referring to children like Andrew Fraser. It was part of a turning point in child psychiatry toward defining mental illnesses more on the basis of observable behaviors and less on a patient’s life history. This approach located the problem in the child’s brain — separated it, in a way, from the child’s character. That opened the way for large-scale use of medication to change the behaviors. could fit into that definition. The scientists who study ADHD believe these children are predisposed to it by particular patterns of brain chemistry, with most cases having some sort of genetic basis, others possibly the result of environmental factors during pregnancy or after birth. Because there are no blood-borne proteins that define when a kid has ADHD, no lumps on the head or in it, no physical marks of any kind that clearly distinguish a child with ADHD from anyone else, the diagnosis remains controversial in society at large, even as the number of children — and, increasingly, very young children — who are treated for it is skyrocketing. Once upon a time, kids like Andrew were termed “fidgety Phils,” or “behavior cases,” and were stuck in the corner or the principal’s office until they shaped up or left school. Some went on to become corporate executives. Others became jailbirds. Many struggled with the responsibilities of adult life, but others basically got it out of their systems after puberty. Today an estimated 3 million children in this country have been diagnosed with ADHD — including perhaps 200,000 between age 2 and 4. With numbers like these it is not surprising that the diagnosis is controversial or that it has become enmeshed in many of the cultural battles of the past two decades, America’s fretful internal argument over the proper way to parent and educate the young. While scientists struggle to provide a unifying theory of what’s different about the brains of children with ADHD, critics charge that it’s wrong to view these kids’ behavior as pathological in the first place; the fault lies with overcrowded schools, stressed-out parents with little time for the children and a society that wants to dull its rough edges and is intolerant of anything but success. Other, less radical critics of the system still believe that ADHD is severely over-diagnosed in America. At the heart of the controversy over hyperactive disorder is that most children diagnosed with it get the same treatment: a stimulant. Stimulants have been used to treat hyperactivity and learning disabilities since 1937 when an Oregon scientist named Charles Bradley noticed that Benzedrine perked up the attention levels of several children in the special school where he worked. It wasn’t until the 1960s that doctors began regularly treating hyperactive children with methylphenidate — trade name Ritalin. Researchers had long reported that Ritalin at low doses had a paradoxical effect — it was “speed” that slowed children down. Eventually it was recognized that stimulants had the same effect on almost everyone: They improved short-term concentration. It was just that people with ADHD needed more help focusing than the rest of us. There was a brief backlash against Ritalin in the 1970s, when some studies suggested it might stunt a child’s growth, but later research indicated those worries were overblown, and by the early 1990s, when society had generally embraced the idea that many problems could — and should — be dealt with by a pill, Ritalin had taken off again. Even the biggest proponents of drug therapy agree that drugs work best in combination with behavioral modification and talk therapy. But talk is not cheap in the era of managed health care. And the thing about Ritalin and other stimulants is, they get results. Study after study has shown that low-dose stimulants will improve short-term concentration and reduce impulsivity and fidgetiness in about three-quarters of the kids who get them, as long as they’re on them. These kids will often do better in school. They won’t anger and alienate friends and teachers as much. That makes their parents saner. As a result of these things, the children often feel better about themselves. How does Ritalin work? As with much about ADHD, no one is exactly sure, but it is evident that Ritalin increases the availability of dopamine, a chemical that’s key to movement and attention and other nervous functions, to certain cells in the brain. By adding to the dopamine pool, the drug seems to speed the flow of impulses through the circuits that help people control the instinct to respond to each and every stimulus. In a way, you could say that Ritalin strengthens willpower. Or, as Ellen Kingsley, the mother of a 13-year-old who has been on ADHD drugs since age 5, puts it: “It enables him to do the things he wants and needs to do and would not be able to do.” Kingsley, a former Channel 9 consumer reporter who now lives in Houston and puts out a magazine about ADD, says her son T.K. would never have made it through school without drug therapy. Like many parents of children with ADHD, Kingsley is impatient with people who don’t recognize that kids like hers are deeply impaired and need help. “I could give him all the therapy in the world, but it won’t sink in without medication because he can’t attend to the task,” Kingsley says. Parents with a morbidly hyperactive or inattentive child, most specialists agree, should be no more reluctant to try Ritalin than to give eyeglasses to a nearsighted child, if Ritalin will calm their child and improve his or her life. But among the millions of parents who have put their children on a permanent ration of behavior-modification drugs, many have undoubtedly had to overcome an initial queasiness and feeling of guilt. Laura and Barney Gault certainly did last fall, when a pediatrician suggested that their son, Sam, might need to be medicated. It is a dreary winter evening in the cafeteria at Olde Creek Elementary School in Fairfax, and Sam’s den leader, Jeff Bush, is attempting to get Sam and eight other rambunctious 9-and-10-year-old Webelos to drill for their civics merit badge. The den leader’s presentation isn’t really pulling in the audience. The boys, a few in their blue uniforms with yellow kerchiefs, most in ordinary kid clothes, are popping up and down in their seats like ducks in a shooting gallery. They all seem to be talking at the same time, except for the kids who are falling off their chairs. Bush’s questions invite an array of non sequiturs. “Who is the vice president?” he asks. “Sore Loserman!” one scout responds. “Can a 14-year-old be president?” someone else jumps in. At the far end of the table, quietly fabricating spitballs and loading them into a straw, sits Sam Gault. You wouldn’t necessarily know that he’s the one with ADHD. He doesn’t seem hyper. And he’s very focused — not on Jeff Bush, unfortunately, but he’s very focused on his spitballs. He fires across the room at his mother, Laura, and narrowly misses. Laura, with short blond hair and dangling earrings, is keeping a close eye on her son. Sam is the shortest in the group, thin and gap-toothed, with blue eyes and diaphanous skin. On the previous Saturday, the den took a field trip to a firehouse. During the tour Sam got bored and started making silly remarks: “Is this an atomic bomb?” he asked about a high-pressure hose. “Is this a nuclear weapon?” Finally the fire chief turned and scolded him. Laura finds such incidents painful and hopes that, eventually, Sam will be embarrassed, too, and change his behavior. “When kids are continually singled out, it just whittles away at their self-esteem,” she says. It was partly concern about self-esteem that led the Gaults to take Sam in for a psychiatric evaluation more than a year ago, when he was 8 and in third grade. Sam was bright and thoughtful and didn’t do poorly in school, but he couldn’t sit still. Time and again, his second-grade teacher reported that Sam had trouble following through with her instructions. He raised a ruckus in the halls and played the class clown. He literally climbed the walls at times. Sam was an inquisitive, detail-oriented child, but his mind had a way of meandering from the critical to the banal. You could hear it in his speech as he drifted from one topic to the next — teachers, Game Boys, his ADHD — without clearly completing his thoughts on any of them. Laura Gault had had forebodings before Sam was diagnosed with ADHD. She felt that Sam’s ADHD might have had a hereditary connection — Sam’s paternal grandfather, who’s now in a nursing home, probably had ADHD, though in his era, of course, such a thing was not recognized. Even as an adult, he was impatient and impulsive like Sam, and sometimes he blurted out off-color remarks in mixed company. And that’s partly what bothered Laura about her son — the social improprieties. “I noticed that the other kids would be acting out, but they could stop when an adult said stop,” she says. “Sam really couldn’t stop. Kids who wiggle too much stand out in a big classroom, where sheer management is a real challenge. Sam’s class had 28 other children. After Sam was diagnosed with moderate ADHD, the Gaults were urged by their pediatrician to start out with a behavioral modification routine. They got his teacher to provide daily reports on Sam, and rewarded good behavior with trinkets — a Pokemon card here, a trip to the ice cream parlor there, a sleepover for being especially on-task. But within a couple months it was clear this regimen was not enough to motivate Sam. That’s when the Gaults turned to Adderall, which last year surpassed Ritalin to become the most prescribed stimulant in America. “Throw it, Sam!” shout two of his friends. Sam does not respond. He is carefully folding the edges of the sock to make a rounder, more compact megabomb. One quality of Sam’s mental architecture, it’s plain to see, is a certain perfectionism. For better or worse, Adderall hasn’t done anything to change that. Finally he throws and — whack! — the sock bomb smacks a boy named Chris as he attempts to flee. Teammates cheer. Sam betrays no emotion but lets out a belch of conquest. “He’s very proud of that,” Laura says, rolling her eyes. Notwithstanding that ADHD can be a serious disease, the diagnosis of ADHD in America is an inexact science shaped in large part by the socioeconomic milieu of the kid in the middle of it. All it takes is a look at the diagnostic guide to see that. — almost anyone with a child could imagine him or her meeting the diagnostic criteria, on a bad day at least. To be sure, the diagnostic guide also requires that to be ADHD, the symptoms must exert a significant impact on the child’s life at home and school. But “significant impact” requires a context and that’s where the controversy about ADHD begins. Every November, just after parent-teacher conference days in many schools, Barbara Ingersoll, a leading ADHD diagnostician in Bethesda, begins to get calls from parents. Ingersoll, a psychologist, performs assessments of children that parents can use to procure medications, therapy or classroom accommodations — all tools employed to get ADHD children through school with a modicum of success. The family decided to get a second opinion. A child psychiatrist at Washington’s Children’s National Medical Center rolled his eyes when he heard about the diagnosis. ADHD was a “garbage can label,” he told them, the diagnosis for any kid who was out of the box. Their boy was too young to be diagnosed definitively, he said, and the diagnosis wasn’t a trivial matter. Ritalin could mask an underlying condition, or it could cause serious side effects. The kindergartner had tics, and children with tics sometimes developed full-blown Tourette’s syndrome after going on Ritalin. Deep in their guts it felt wrong to the parents and they worried it would stifle their son’s nascent creativity. When he was reassessed at a clinic two years later, the ADHD label turned out to be wrong. The boy was dyslexic. He wouldn’t sit still in school, it turned out, because he couldn’t make sense of the words put in front of him. In the meantime, the family had switched their child to a public school in Maryland. What almost happened to this family captures society’s fear of Ritalin, that the drug is being used to convert spirited children into docile sheep. But for most children on medication, the real problem isn’t that the “meds” turn them into robots; it’s that they rarely work as one would hope. At least half of the children diagnosed with ADHD also suffer from complex mixtures of other problems — learning disabilities, anxiety, depression — that can mandate a complex mixture of other drugs. Theoretically, you can find a drug to treat each symptom. But the relationship between a behavior and the underlying biological facts isn’t cut and dried, particularly in children. morbidities” described by the psychiatrists are caused by the medicines themselves. “Here’s the conundrum — I put you on stimulants because you’re running around the classroom too much and you’re too impulsive and in people’s faces,” says Julie Magno Zito, a professor at the University of Maryland School of Pharmacy who tracks the growing tendency to prescribe mind drugs for preschoolers. “About three months later, it looks like the treatment works, and then you go home at night and need medication to go to sleep. Enter Clonidine to help you sleep. Now we’ve gone from one drug to two. I have to worry about interactions, a wider spectrum of side effects. Last February, Zito and a colleague, Daniel Safer, a child psychiatrist at Johns Hopkins University, made headlines when they published an article in the Journal of the American Medical Association that tracked a threefold increase in the use of stimulants, antidepressants and other psychotropic drugs among 2- to 4-year-old Medicaid patients from 1991 to 1995. The article set off a new round of critical news stories about overuse of psychotropic drugs. And like previous Ritalin scares, the uproar put many physicians and parents who believe the drug can save lives on the defensive. For a long time, Andrew Fraser and his parents hewed to this logic and followed the pharmaceutical trail wherever their psychiatrist advised them it led. They spent thousands of dollars and hundreds of hours in therapy and classes and doctor’s appointments for Andrew. But when the psychiatrist suggested Risperdal, with its terrible potential side effects, it was a step too far. “We’ve got to try something else,” Bruce Fraser told his wife. And so they stepped out of the mainstream and into the Bethesda office of Peter Breggin, who provided an unexpected answer to the problem of their son. “Andrew,” Breggin said, looking at the thin, freckled-faced boy with twinkly blue eyes sitting in front of him, “they say you’re mentally ill, my friend. Peter Breggin, whose office is within mortar distance of the National Institute of Mental Health, is the bete noire of psychiatrists. He has written several books attacking the misdiagnosing and overmedicating of America’s children. Some view him as his profession’s prickly conscience, but his point of view, that there is no such thing as ADHD, is a fringe one among psychiatrists. Many of them believe that his crusading ways have done more harm than good by driving parents away from treatments that could help sick kids. Yet at least a few parents with difficult children view him as a savior who gives voice to their doubts and worries. Breggin is the medical consultant in three separate class action lawsuits that were filed last September on behalf of children medicated with Ritalin. The lawsuits, filed in New Jersey, Texas and California by some of the same lawyers involved in anti-tobacco litigation, accuse Novartis Pharmaceutical Corp., the maker of Ritalin, the American Psychiatric Association, and CHADD, an advocacy group for people with ADHD, of conspiring to poison America’s children. Those being sued have called the lawsuits unfounded and have defended Rita-lin as a good drug and its use as good medicine. “It’s ludicrous to think that by seeking science-based advice for our problems we are conspiring to medicate the nation’s children,” said Clarke Ross, the head of CHADD (Children and Adults with Attention-Deficit/Hyperactivity Disorder). In the first few months of 1999, Breggin took Andrew off the medications, one by one. In family and individual therapy, at $175 a crack, he told the Frasers that Andrew had to learn to act civilized. He could learn to check his impulses, to pay attention, to show respect. Willpower was his to grasp. Wendy and Bruce had to love him tough and tender. The Frasers were happy to toss out the biological psychiatry, with its talk of titration and syndromes and EEG patterns. Ceremoniously, in the presence of his parents, Andrew flushed the leftover pills down the toilet: Out with impersonal chemicals! Thornton Friends. The small Quaker school in Silver Spring was created expressly for kids with promise who had trouble sitting still or paying attention, kids who got teased or harassed in traditional schools, kids who were a little different — but reachable. Thornton Friends stressed individual growth and community feeling. “We want to help people understand themselves and find a style that works for them,” says the headmaster, Michael DeHart. Roughly one-third of the kids in Thornton’s middle school are on psychotropic medications of some kind, DeHart says. He agrees with Breggin, who has written positively about Thornton, that the surge in prescription drug use in children reflects our society’s anxiety to produce kids who fit expectations, and its inability to create schools that handle their needs. When Andrew arrived at Thornton, the administrators were up to the challenge of educating a drug-free Andrew. But it wasn’t a lovefest. In his first three months Andrew showed little patience and a lot of anger. In the middle of English once, he’d gotten up and yelled that he hated poetry. “I’m not going to say Andrew needs to be medicated, and I’m not going to say he doesn’t,” says Jonathan Meisel, the principal of the middle school. Do Andrew and Sam do what they do because of flaws in the wiring of brain circuits that inhibit inappropriate action, or is the apparent difference in their brains more in the nature of an evolutionary mismatch with modern life, an alternate state of readiness that represents a holdover from prehistoric times when extremely alert, impulsive people presumably had advantages in the struggle to survive? These are two of the untestable hypotheses of pop psychology concerning ADHD. This much is clear: Our brains evolved with a great deal of variation. If children’s height was as variable as the size of their brains, some would be giants stooping to get in the classroom door each morning while others would barely be tall enough to reach their computer keyboards. For the past several years, Castellanos has been studying the brains of ADHD children as they appear in magnetic resonance imagery (MRI). He’s doing the measurements to see if size can tell us something about the seat of abnormality. The current theory is that ADHD may derive from abnormal neural circuits linking the frontal lobes, the deep brain structures called the basal ganglia, and the cerebellum. Castellanos and others have found that the brains of children with carefully diagnosed ADHD are approximately 4 percent smaller, on average, than those of healthy children. Some parts of the brains of ADHD children can be particularly small — the posterior-inferior vermis, a tiny segment of the cerebellum, for instance, is 10 to 15 percent smaller, on average. Castellanos doesn’t want to make too much of that — or too little. For the record, he doesn’t know what that teaspoon-size region of the brain does. But he was extremely excited when a study published last May found that in macaque monkeys the posterior-inferior vermis was packed with dopamine receptors. That’s interesting to Castellanos because an inadequate supply of dopamine is believed to hamper attention and self-control. So the smallness of the posterior-inferior vermis in ADHD kids might mean a shortage of the right neural circuitry. The smaller the brain size in these children, the worse the ADHD symptoms tend to be. But there’s an awful lot of variation, Castellanos says. Two-thirds of the brains of ADHD children are indistinguishable, in size, from those of healthy kids. If you’re a skeptic, you say size has nothing to do with it. Similar caveats cover the genetic work on ADHD so far. “My favorite nightmare is there are going to turn out to be 300 or 500 genes, each of which contributes a couple percent of risk here and there,” Castellanos says. The leading candidate gene for ADHD is a variant of the gene known as DRD4. This variant apparently causes a receptor on certain brain cells to have trouble sucking dopamine out of brain synapses. That presumably slows the feedback messages in the brain that inhibit impulses. But you can’t call it a defective gene because it turns out fully 30 percent of the U.S.
population has it, and not all of those people have been diagnosed with ADHD. And not everyone with ADHD has that particular DRD4 gene variant. Moreover, the population of ADHD patients with that gene form might even have a relatively mild set of symptoms. In a study published last year in the Proceedings of the National Academy of Sciences, researchers at the University of California at Irvine found to their surprise that among ADHD patients, the ones with the “ADHD” form of the DRD4 gene were actually less impaired than study participants who had a normal DRD4 gene. At least two drug companies are said to be working on DRD4-related drugs that could be used to improve the brain circuitry of ADHD patients. But Jim Swanson, one of the UC-Irvine professors involved with the study, has an intriguing hypothesis that the ADHD patients with the suspect DRD4 variant might be the subgroup that benefits most from behavioral modification strategies — rather than medication. Because it was treatment, rather than diagnosis, that was the most contentious element of the ADHD debate, the National Institute of Mental Health set out to settle the issue of how best to treat ADHD by funding a six-site, 14-month study comparing Ritalin with behavioral modification and combined therapy. The researchers who designed the study included Ritalin advocates like Columbia’s Laurence Greenhill and behavioral modification proponents such as Swanson. Published in December 1999, the study found that, overall, combined therapy worked best, but drugs alone were significantly more effective than behavioral modification therapy alone. And that would be a good thing. Because the drugs have side effects, and they don’t work perfectly, and there will always be parents who, for a variety of reasons, refuse to give their kids mind-altering chemicals. Before she started him out on Adderall 16 months ago, Laura Gault wrote a letter to Sam that explained his disorder and compared the drug to the glasses a nearsighted kid would have to wear. She wanted him to have something to look at in case he started to worry about being called ADHD. Sam tried to avoid telling friends at school that he had the condition; one reason his parents chose to give him Adderall was that it was long-acting. A single dose, it was hoped, would get him through the entire school day. Kids on Ritalin, which the body metabolizes faster, often have to see the school nurse at lunchtime to get a booster dose — and Sam felt that would be embarrassing. “But,” she says with a shrug, “it did help with his behavior.” Sam no longer seemed compelled to pester his neighbors in class. He could walk from room to room without climbing the walls or rattling a pen along the lockers. But the tiny blue 5-milligram pill he takes at breakfast wears off by 2 p.m., and from that point Sam’s teachers and parents use their wits and wisdom to keep Sam on track. One evening a week, Sam attends a group therapy session with other children with ADHD who need help learning how to act appropriately in social settings. He says he doesn’t like it, but he clearly tunes in — you can tell by his recall of some details. he recites. “First, you stand near them. Then you move closer, and smile. Laura doesn’t give Sam the medication on weekends or evenings, mainly because she worries about his weight. Too, she doesn’t want him to be on medication forever. “Our goal is eventually to get him off,” she says. “From what I’ve read, a lot of boys, once they go through puberty can . . . not outgrow it exactly, but the hyperactivity can be less. For now coping begins with the pills, which clearly have an effect. Sam forgot to take his medication the first day back at school after winter break this year — and the teacher noticed right away. He couldn’t sit still and his attention wandered. Which got Laura thinking again about the dosage. “I’ve been kind of waiting to see if there’s a need to increase it,” she says. Before Thornton Friends’ two-week winter break, Jonathan Meisel had written up a contract for Andrew. It was a one-page list of do’s and don’ts, and it essentially stipulated that if Andrew’s behavior didn’t improve, he was out of the school. One thing the contract required was more frequent therapy, and so Andrew began seeing Breggin weekly, instead of every few months. But the new system also made a concession: Instead of writing by hand, which was torture for Andrew as it is for many ADHD kids, he was allowed to bring a laptop to school so he could type his notes. All in all, it was a challenge. Recently, Andrew has begun to feel he has a goal in life. He downloads music from the Internet and burns CDs for his friends, earning a little money that way. He’s been thinking he’d like to take a mail-order computer course. In written evaluations submitted at the end of the third week of the new trimester, all of Andrew’s teachers had noted a remarkable turnaround. Randy Mackiewicz, Andrew’s foreign language teacher, went further. “We’re proud of Andrew’s progress,” he wrote. His parents are keeping their fingers crossed. © 2001 The Washington Post Company Sunday’s edition of the Washington Post has a very interesting article about ADHD. It can be found on the Post’s web site.